In my Judiciary Chairman’s office, I have my grandpa Maurice Karamatsu’s samurai sword behind me as a reminder to go all-out with strength and determination. I am back seven hundred times stronger and even more determined to accomplish everything I set my mind and soul to do. All negativity will be converted into positivity. I have become stronger physically, mentally, and spiritually. I am going to live everyday as if it will be my last. As I look back at my life, I am so grateful for my family and friends. I appreciate every girl I dated and every person I have met. I am also thankful for my health. Life is so short, you never know when your time will come. In the way of the samurai (bushido), one must be aware of death at all times. When you are constantly aware of your impermanence, you appreciate your loved ones and your life. Body is nothing more than emptiness, emptiness is nothing more than body. All Bodhisattvas and Buddhas have practiced to understand “emptiness” in order to have no delusions. With no delusions, there is no fear. Bushido and Buddhism teachings gives us the guidance to not fear death by always preparing for death. We live to die. We should never be dying to live where you are always angry, placing harm on others, jealous of others, sad, wishing you could live a better life, or just living day-to-day. Rather, we must strive to be happy, spread positive energy to others, and do all we possibly can in life. We must try to face life’s challenges and live life to the fullest because we live, knowing we will die. It is not easy to master this, but it is worth trying as hard as we can. I look forward to everyday of life. I can’t wait until the next day to work, exercise, enjoy my family and old friends, meet new friends, and make the most of my life. I appreciate everything. On Sunday, December 21, 2008, I turned 34 years old. I attended a Shinnyo-en service at 10:00 A.M. I ate lunch at Ala Moana Shopping center and bumped into my friend Nish. My friend Scott Imaye, back home for awhile from Tokyo and Gavin Doi joined us to get our Christmas shopping done. I guess it takes an entourage to get good ideas to get our shopping done for family, friends, and business contacts. I celebrated my birthday with my mom, dad, and sister Lara at Gyu-Kaku at 6:00 P.M. My sister and I joined the crew at Loulou’s after and we continued shopping until the mall closed. My great uncle Roy Sadato Okubo recently passed away on December 2, 2008. I attended his funeral on Saturday, December 20, 2008. He was 86 years old and my late grandma Bessie Karamatsu’s younger brother. When my grandma’s health was failing in the Spring of 2006, Uncle Roy held her hand by her bedside at the Queen’s hospital. Uncle Roy is a member of the 442nd Regimental Combat Team, 522nd Field Artillery Battery B. For most of my life I didn’t know I had a close relative that was a member of the famed 442, and when people asked me if I had a relative from this unit, I would reply “no.” I am glad I told my uncle how I appreciated his sacrifice for us. I recently found out that during the war, he could have returned home, but decided to stay with his friends and continued to serve. I am so proud of him, and I am sure he is happy with his late wife, family, and friends, including my grandma. 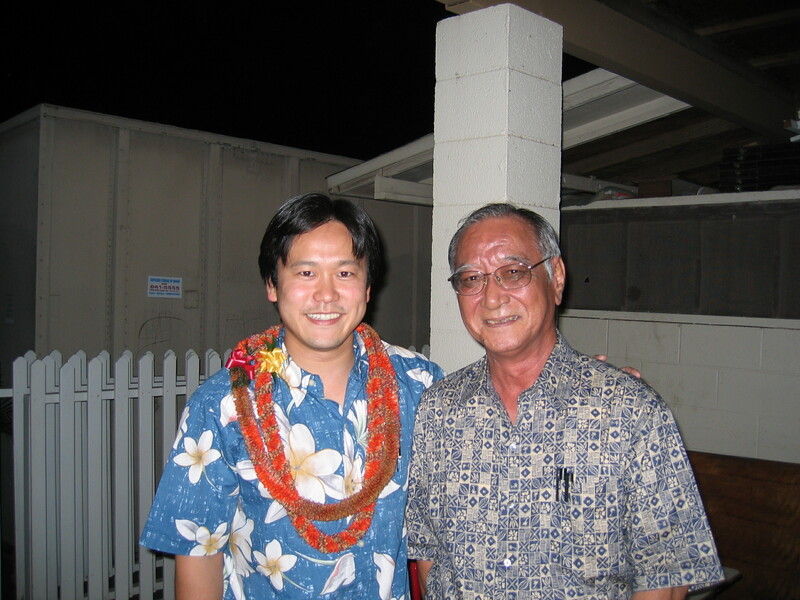 Rep. Bob Nakasone and I at my fundraiser at St. Andrew’s Priory during the 2006 Legislative Session. “Nada Sou Sou” by Rimi Natsukawa. This is a song about the loss of a loved one. Rep. Nakasone is of Okinawan ancestry and I remember him telling me that he was tired of traveling, but he would consider going to Okinawa with some of us in the House in the future. I feel this song is fitting for him. On Monday morning, December 8, 2008, I got a phone call and was told that Rep. Bob Nakasone passed away the day before. I felt deep sadness. He was my mentor and friend, a person that was so humble but very strong at the same time. Rep. Nakasone was the stability of the House and the State of Hawaii. Anyone and everyone would go to his office for advice, support, and friendship. You name it, representatives and senators of both parties, including House Democrats who were dissidents, the governor, lobbyists, community leaders, and friends. His closest friends and colleagues always looked forward to meeting with him. He read the laws and other information constantly and was a wealth of knowledge. In the 2002 Legislative Session, I had returned to Hawaii after graduating from law school and was working for Senator Carol Fukunaga. In April 2002, after finishing work at Sen. Fukunaga’s office, I joined Blayne and I believe Reena at Rep. Luke’s office. I had my binder that included my campaign strategy for 2002 that I began in 1996. I showed Blayne my plan. We went out the back entrance of the office to the balcony. There was a small crowd making noise a little further down West. We walked down and an older Japanese man said something like this, “Hey, come inside.” I entered the office and noticed Rep. Jerry Chang and Speaker Joe Souki among a few people. Rep. Chang told me to sit down on a chair by him. He made me a cracker with a spread on it. He asked me where I worked and I told him Sen. Fukunaga’s office. Later in the conversation I told him I was running for the House. Rep. Chang yelled out to Speaker Joe, “Hey Speaker, we got a new representative here!” Later, I found out that the older Japanese man that invited me in was Rep. Bob Nakasone. I didn’t even know who he was. I thought he was staff at first. I got elected that November of 2002 and quickly became friends with Speaker Calvin Say, Rep. Jerry Chang, and of course, Rep. Bob Nakasone. As a young representative at 27 years old, I had my way of thinking, but I quickly realized that I had so much to learn. The three of them played a big role in strengthening my legislative and political foundation. What I learned from them, you can’t get from any degree, including my political science and law degrees. I went to Rep. Nakasone’s office often on a regular basis to seek his point of view, understand history on an issue, and review laws and bills. I enjoyed spending time with him and so many people that went in and out of his office. At night, his office was called Club Bob’s. There were healthy debates on issues. Most importantly, there was always laughter and happiness there. It was like a haven from all the stress of politics and life in general. Rep. Nakasone had this strength that made you feel that everything was okay. In the 2005 Legislative Session during the conference period, I was worn down after being yelled at by a couple of chairs in the House and a Senator. I always just took the hits and tried my best to stay calm. I was working on a middle ground on one issue and there was miscommunication on another issue. The stress and emotions within me was at a threshhold. I entered Rep. Nakasone’s office and just yelled out my frustration in three words. I walked straight to the balcony and repeated my statement. Speaker asked me, “what’s the matter and told me to come by him?” He was sitting in the dark with Senate President Bobby Bunda on a couple of lawn chairs. I sat on the concrete slab by Speaker Say and Rep. Nakasone came out of his office and sat by me on the concrete slab on the other side. Speaker talked to me and made me feel better. Rep. Nakasone didn’t have to say anything, but his presence just made me feel better. I will never forget that night. In the 2007 Legislative Session, I was Vice Speaker of the House. During the conference period, Speaker Say told me to stay with Bob and make sure everything goes okay with the Hawaii Health Systems Corporation bill. That bill went to the midnight deadline with the language Rep. Nakasone wanted. Before the 2008 Elections, I had a small talk with Bob in his office. As usual, he asked, “So how’s everything?” I told him everything was okay. He told me, “Don’t forget your dream.” I looked at him and said, “Rep. Nakasone, I don’t know. I can’t see past tomorrow.” He stated again, “Jon, don’t forget your dream.” I looked up to him, smiled, and nodded. Those were the last words he told me. He was hardly in his office and I was campaigning like crazy, so we didn’t get a chance to talk to each other again. This past Tuesday, December 9, 2008, I laid in my bed all night thinking about Rep. Nakasone. I couldn’t sleep. I listened to music with my Ipod and headphones, but some of the songs just made me more sad. Last night, December 12, 2008, I was working late at my office. My friend and her daughter came by. At about 9:15 P.M., we decided to walk to see the Christmas lights at Honolulu Hale. As we walked down the stairs towards Iolani Palace, I heard a crowd making noise above us and then there was a loud laughter from a lady. When I looked up to see where the noise was coming from, it was in the area of Rep. Nakasone’s office. All of a sudden, there was pure silence. There was no one there and no lights on anywhere. No one was around us on the ground floor either. I asked my friend if she heard what I heard and she said “Yes.” All of a sudden, rain began to pour down heavily, so we returned back into the capitol to my office where I finished my work. Later, we went to see the Christmas lights at Honolulu Hale. I truly believe the noise was from another Rep. Nakasone gathering with some of his old friends at his office. From the sound of it, there was so much joy and happiness. Rep. Nakasone is happy and still here for us. I will continue to seek advice from my dear friend and mentor. He is in my heart forever. I can’t believe this is the last month of 2008! I have so much unfinished work to do. I attended the Board of Regents of the University of Hawaii Reception at Kapiolani Community College’s Ka’Ikena Dining Room in the Ohelo Building at 5:00 P.M.